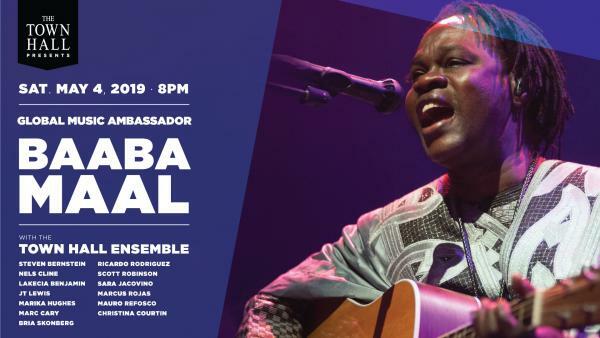 The great singer/songwriter/guitarist Baaba Maal returns to New York City for the first time in 8 years. Baaba is an international music ambassador from Senegal, celebrated for his fusions and collaborations and his soulful and empowering songs, including his recent work on the Oscar-winning score for Black Panther. Baaba Maal is joined by the Town Hall Ensemble. Under the direction of trumpeter Steven Bernstein, the Ensemble features renowned New York musicians from a broad spectrum of styles and embodies the many voices of New York City, as The Town Hall has done for nearly a century. Tonight’s all-star ensemble features: Nels Cline (guitar), Lakecia Benjamin (sax), Marika Hughes (cello), Marc Cary (piano/keys), JT Lewis (drums), Bria Skonberg (trumpet), Ricardo Rodriguez (bass), Scott Robinson (sax), Marcus Rojas (tuba), Mauro Refosco (percussion), Sara Jacovino (trombone); Christina Courtin (violin).